Matching Fund Challenge 2013 - Every donation is being matched one-to-one right now! The monsoon arrived in Pune in July, bringing rain and the seasonally damp air that now, three months later, are starting to be replaced by sunshine and drier days as the rains subside. The monsoon is welcome as it is necessary for the success of crops and for replenishing the municipal drinking water reservoirs after the dry, hot summer months, but it also causes health and safety concerns for many of AIC's families. During monsoon, homes in AIC’s impact area become very damp, and the ability to maintain sanitary conditions decreases. According to Dr. Madhavi, counselor and doctor on staff at AIC, there are several sicknesses that see a spike due to risk factors associated with monsoon season. For example, many families eat 2 or more meals a day from inexpensive and quick food stalls in the basti (slum), and due to unhygienic food preparation, reused cooking oil, and questionably sourced water, gastrointestinal upsets such as chronic diarrhea and nausea occur. In addition, contagious viral fevers with symptoms of runny nose, cough, and fever increase, and mosquito-borne illnesses such as dengue fever and, to a lesser extent in Pune, malaria become cause for concern. Why so wet? Most housing structures in the slums are made from a combination of masonry material, corrugated sheet steel, and wooden support beams. Unfortunately the ability to created sealed joints using these materials is not possible, which results in leaks that can come from both the walls and the roof. Though leaks can’t usually be avoided 100%, measures can be taken to reduce the amount of water that enters the home by covering it with a heavy tarp, weighing it down with large rocks to protect it from blowing off in high winds, and securing it with rope. It is not a huge cost, usually around Rs. 3,000 (USD $50.00), but there are many who simply cannot afford it. Billo, a Sikligar woman, lives with her four children, each of whom receives education and healthcare services from AIC (a fifth child currently stays with relatives in Mumbai). Her family’s partnership with AIC began in 2011; at that time they had been living in a makeshift tarpaulin shelter on the roadside and Billo was working as many hours as possible to provide what she could for her children as a day laborer, separating copper from scrap metal. When monsoon came every year, the family began a constant battle to keep their belongings dry, which sometimes meant moving everything to safer locations as and when they could. With sick children and an unstable living environment, Billo often missed days of work and her income suffered as a result. This year Billo and her family moved into their first home, and during this monsoon season she will not have to worry about a leaking roof due to a Rs. 3,000 microloan that she obtained through the AIC Community Outreach Program. With a stable shelter and the security of knowing her family and belongings are safer, Billo says she can now work more hours and increase her income, which will help her family in the long run. With a home, a roof, and happier, healthier children who are doing well in school, the future certainly looks as if it will be brighter for Billo and her family for many monsoons to come. As the school year came to a close last month, the AIC Pre-Primary School children were treated to a field trip at Pune's historic Empress Gardens to celebrate the hard work of all of our students and teachers this year. 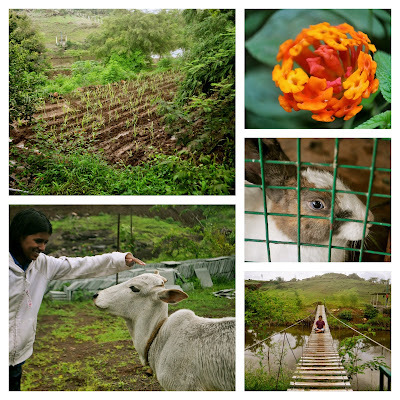 The children were thrilled to have an opportunity to trade the crowded, slum environment of urban Yerwada for the lush, green landscapes of the so-called "Jewel of Pune." On the morning of the outing, they were so excited that they even began lining up at the AIC Education Outreach Centre several hours before the bus was scheduled to depart! Following a bus ride that can only be described as "rousing" (lots of singing, nursery rhymes, bouncing up and down in seats! ), the children could barely contain their excitement as Bunty didi sorted out tickets and they were allowed to walk through the entrance gates. Once in the garden, the teachers and caregivers divided up the children and let them loose on the playground, where they spent the next hour enjoying slides, swings, balance bars, climbing ropes, and merry-go-rounds. When the mid-day sun started to get hot, the children tromped through the stream that flows through the garden, cooling off briefly before taking rides on the miniature train that runs through the sprawling lawns. Judging by the kids' delighted shrieks as the train rounded each corner, this ride was definitely among their favorite parts of the trip! Finally, the time came for a picnic lunch! The children and staff settled in under the trees and unpacked a special lunch of idlis, coconut chutney, chips, and juice boxes. Everyone had certainly worked up quite an appetite by this point, and the children polished off the food in no time. Eventually, the time had come for AIC teachers and caregivers to herd the children back to the buses so that everyone could head back to the Education Centre. Since the picnic, the children have been talking non-stop about this fun-filled excursion to one of Pune's most beautiful historical sites and the memories they made on this day. Since most of these children rarely leave the streets and slums, we at AIC look for every opportunity to provide exposure to other environments and experiences. We greatly appreciate the support of our donors in making this field trip possible for AIC's youngest and most impressionable pupils and would also like to convey our gratitude to Sapling Nursery for so generously donating the use of their buses to transport the AIC children to and from the gardens. Thank you! She was standing near the flag pole, dressed in her gray salwar kameez uniform. Her eyes, shining with the pride of achievement, visible even from a distance, constantly flitted in a particular direction, as if seeking some sort of reassurance. I followed her gaze and saw a middle aged couple - her parents, I guessed. She was Suman Waghri, a 14-year old student of the AIC Education Outreach Program and the Chief Guest of our Republic Day function at Ashraya. She had been given this honour for her consistently good academic performance at her school for the past 3 years; a feat even more laudable due to the fact that her parents would rather she did things “women are supposed to do.” Despite these hurdles, this 6th standard student staunchly ploughed on, determined to show her parents what sheer willpower and dedication can achieve. After the function I had a tête-à-tête with Suman, where she talked about her life, hobbies and what motivates her. A student of Agarkar Girls' High School, Suman’s day usually starts with a steaming hot breakfast at the AIC Education Outreach Centre, after which she and her friends are dropped at the school by one of the AIC drivers. She returns to the Education Centre, has her lunch and then starts with her tuition classes which go on till 3, sometimes 4 in the afternoon. After that, she heads home to help her mother with various household chores. With a flair for singing and oration, she also enjoys sketching and dancing, and takes classical dancing lessons at the AIC Education Centre. A girl with a lot of energy and passion indeed! Her zeal was visible in the multiple performances she gave at the Republic Day function that day. Even at school she radiates the same enthusiasm, as the monitor of the class and every teacher’s favourite student (nothing surprising there!). Her favourite teachers at AIC include Ms. Vaishali, the dance and drama coordinator, and Ms. Shweta, an engaging, young teacher who helps her with her academics. Apart from her parents, Suman has 5 sisters and 2 brothers in her family. Her parents sell old clothes for a living and have a difficult time making ends meet. Under these circumstances, it is not surprising for parents to discourage their daughters from going to school, as the sons are given preference. Even when parents like Suman's do want their children to be educated, there’s the question of funds. AIC, in such situations, acts like a last beacon of hope. Talking about Ashraya, she said that it has really changed her life, “I enrolled here in the 1st standard and I absolutely love it! Everyone is very supportive, especially MK Didi. My life is so much easier thanks to Ashraya. We get a lot of facilities which earlier we could only dream of,” she said. Talking about her school performance, she said, “I was ranked 1st in class I, II, III, V & VI & stood 2nd in Class IV. But what makes me really happy is that a lot of parents in our slum have enrolled their children in school after seeing me do it. I like that.” She finishes with a genuine note of happiness in her voice. When asked about her plans for the future, Suman is surprisingly clear headed, “Right now, I want to finish schooling and go to college. Someday, I want to work in the finance sector.” A very appropriate goal, considering that the young accountant is already helping her parents keep stock of their tradeable goods! Suman's parents were there on Republic Day when she received the special prize from AIC Director of Education Development, Mary Kay Hazel, for her academic performance. Her father at this point stood up and came to where Suman was to stand beside her in front of the audience. Looking at the pride in the eyes of a visibly touched father, I felt hope that Suman would be successful in breaking through this brick wall and all the others that will attempt to stand in her path as she works to achieve her dreams. Devendra and Ranjana have been two of AIC's students since not long after the Education Outreach Program's inception. They are the oldest two of their parents' four children; Ranjana is 14 and Devendra is 18. Both are still in primary school. For years, Ranjana and Devendra were shuffled through the mainstream Indian government school system, held back in the same class year after year, because with IQs in the low 40s, their intellectual handicaps make it impossible for them to keep up with their classmates. After the Right To Education (RTE) Act was implemented in 2009, including the mandate that no student be held back or expelled until the completion of elementary education, the schools had no choice but to promote them, yet as their peers learned to write compositions and add fractions, Ranjana and Devendra struggled to write letters and numbers and were generally ignored by indifferent government school teachers. Although they loved attending tuition classes at AIC, had excellent attendance, and participated enthusiastically in activities and extracurricular opportunities, it was clear that they were falling through the cracks in a 'mainstream' school. For several years, we at AIC have attempted to convince Ranjana and Devendra's parents to allow us to enroll them in a specialized school, so that their needs could be addressed more comprehensively, but fear, prejudice and community misperceptions always stood in the way and their parents refused to grant permission. This year, however, a dedicated AIC volunteer, Rinku, took it upon herself to get Devendra and Ranjana enrolled into a more appropriate educational institution, no matter what it took. After many hours of hard work, including tours of schools, phone calls, counseling Ranjana and Devendra's parents, and running around to line everything up, Ranjana and Devendra were successfully enrolled in Kamayani School for the Mentally Handicapped in June. Since then, they have truly blossomed at their new school. In the last couple months, Ranjana and Devendra have earned certificates of achievement in maths, handwriting, and class participation, and Devendra was even featured in the local newspaper recently! Their parents, initially fearful of sending their two eldest children to a school for students with special needs, have seen the transformation since June and are thrilled that they have adapted well and are finally receiving the educational services that they deserve. Ranjana and Devendra are still familiar sights around the Education Outreach Centre, of course, and everyone at AIC is tremendously proud of their progress in these last few months. And a positive update! Following the untimely death of her father this summer, Sheela, top right, has been enrolled in school and is finally attending with regularity. While it is frustrating that a child should have to wait until age 12 to truly begin her education, we have renewed hope for Sheela's future. Read more about Sheela here. In July, the Residential Program kids had a long holiday weekend. 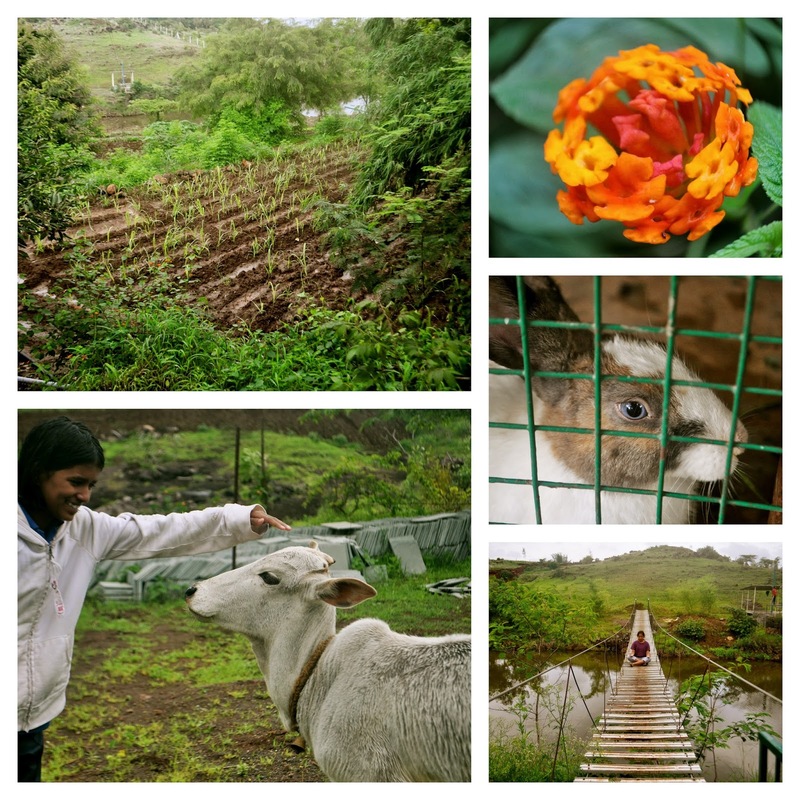 And, after a hot, dusty summer (March - June in Pune) and a month at boarding school in the heart of the city, how better to spend a long weekend than in the rural outskirts of Pune, enjoying the lush greenery and clean, crisp air of monsoon season? The children, Sangeeta, and volunteers Jenni, Katie and Marcela headed to an eco-farm called The Hidden Oasis in Saswad, a beautiful spot about half an hour outside of the city. There, they spent a great (albeit rather rainy and muddy) 4-day weekend exploring the farm, riding horses, learning the ins and outs of vermiculture, making friends with the animals (rabbits, cows, donkeys, etc), visiting a nearby orphanage for girls that is affiliated with the farm, daring each other to take turns on the zipline, scouting for ripe fruits and vegetables and filling up on delicious home-cooked meals. The kids unanimously agree, though, that the best part of the trip to The Hidden Oasis was tromping around in the nearby river and dam (check out our gang of meditating sadhus in the picture below!). They spent nights watching movies on a volunteer laptop (a throwback to our pre-projector days when all movies were watched crowded around a 15" computer screen), practicing Marathi (and learning a little German!) with the volunteers, and even throwing a late night dance party when MK didi and volunteer Abby joined them for their final night at the farm. On Sunday, everyone was sad to head back to school, but grateful to have had a long weekend spending time together and enjoying new activities. instituting subject-specific teaching workshops to introduce teachers to newer techniques and best practices for specific concepts and subjects. To better meet the emotional, personal and social needs of the children, our new counselor, Suchitra, transitioned from her role as a member of the teaching staff to her new job at the start of the new school year. Suchitra has been a part of AIC for a number of years now while working through a college degree and most recently, a Master's degree in Psychology. She has a separate office so that she can hold regular counseling sessions with children who need additional support. She has also commenced sensitivity trainings and seminars with the teachers. We are happy to know that we can now better support the emotional and mental health needs of the children, and that we can do so in a sustainable way by investing in our staff. The Education Centre was closed to students for break during the month of May, but teachers and staff utilized the time to plan the upcoming year, arrange and catalog books into a library of resources to be used alongside teaching, and participate in basic computer and internet training so that they will be able to more effectively use these tools to access teaching resources and enrichment materials for their classes. They will continue this training and exposure throughout the year. We have also begun mandatory spoken English classes twice a week for the Marathi-medium teachers, and their spoken English skills are rapidly improving. As of in June, each teacher is also now required to spend an additional one to two hours of preparation time per day at the Education Centre. We have already seen improvement in our teachers’ daily lesson plans and attention to administrative tasks, grading, student evaluation, and classroom preparation. We have also had a truly fabulous team of volunteers (thank you, thank you, thank you!) on the ground lately and would not have been able to make as much progress without their hard work and dedication. There is more on the horizon that we are excited to share soon! 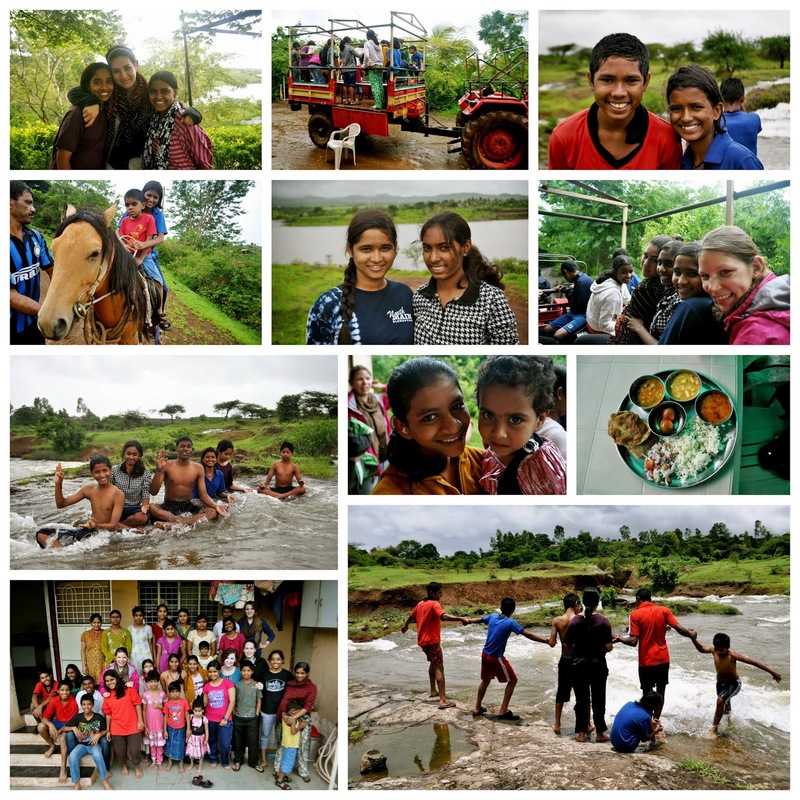 News, funny stories, interesting events, anecdotes, and adventures from the Ashraya Initiative for Children in Pune, India! 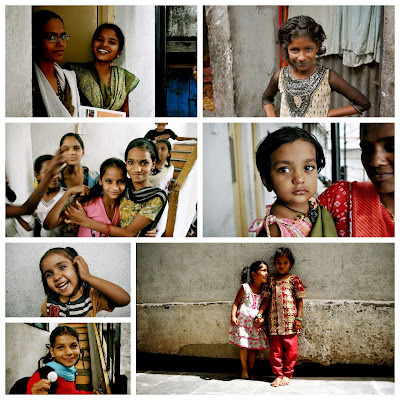 The Ashraya Initiative for Children (AIC) is a home for street kids and various community outreach projects located in Pune, India. We operate 4 programs: a Residential Program, an Education Outreach Program, a Health Outreach Program and a Community Outreach Program.